The 3rd-floor room shared by Schiit and Salk Signature Sound was so crowded the first two times I stopped by that I couldn’t listen, But the third time, Béla Fleck’s classic “Flight of the Cosmic Hippo” was playing, I snagged a second-row seat and liked what I heard. A big, clean sound from an affordable system. 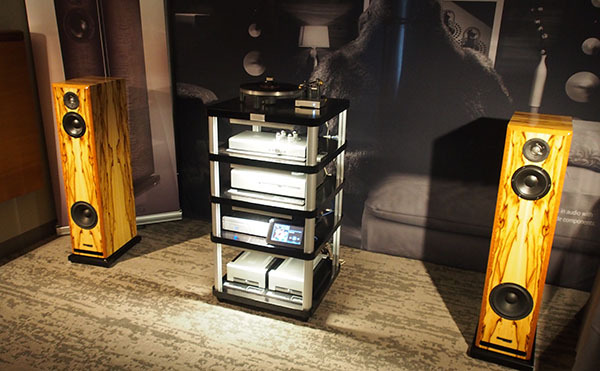 Speakers were Salk’s Song3 BeATs ($4495/pair, $4795/pair in custom finishes like those at the show); source was either a Salk Streamplayer Gen III ($1695) feeding Schiit’s Yggdrasil DAC ($2395) or an SOL turntable (estimated price $799); phono preamp a Schiit Mani ($129); preamplifier a Schiit Freya ($699); and amplifier a Schiit Aegir ($799).